Addressable photoelectric smoke detector 930E works with our addressable MN300 panel via a 2-wire bus. The detector realizes real-time acquisition of the in situ smoke concentration data and sends back the data to a fire alarm control panel. It can also receive and execute the control commands given by a fire alarm control panel. It can realize electronic coding and rewrite the address via coder in situ. Within a single-chip microcomputer, it can process the sampling data in real-time, save the latest 144 historical data and realize a curve tracing for the field situation. 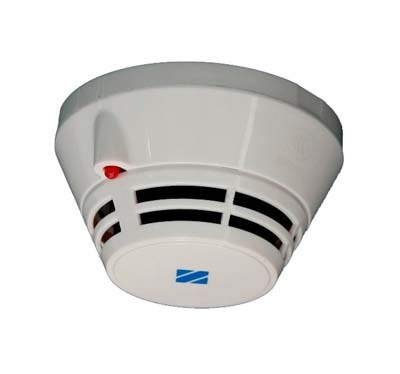 It has a temperature, humidity and dust accumulation drift compensation function and a sensor fault detection function (fault reporting to fire alarm control panel). Non-polarity, two-bus connection that ensures convenient installation and maintenance. Designed with an upper cover and a lower cover and installed on an independent base, it can be installed, debugged and maintained conveniently. The detector is suitable for such industrial and civil buildings that have a great deal of smoke during fires but no smoke under normal circumstances, such as restaurants, hotels, teaching buildings, office buildings, computer rooms, communication machine rooms, libraries and archives. It is not suitable for places with a great deal of retained dust and water mist, places where steam and/or oil mist may be generated and places with retained smoke under normal circumstances.